Having gone through my own First Draft in 60/120 days planning month twice now, I’m approaching it a little differently this time. I know now that some of the tasks take longer than I’ve allowed, and some can be combined with others into one day. Plus, I’m starting this time with a more concrete story idea than I’ve had in the past, so some of the developmental tasks are already done. And I’ve included more days for doing some “pre-writing” to explore opening scenes and character viewpoints and see what might not be working in my story outline/timeline. When I went back and looked at it this last time, I realized that there’s really no point in taking a whole day’s writing time (one hour) to set up sections of the story bible that really won’t be used much until after I start the writing process (the Day 2 pages), whereas the Characters, Props, and Settings sections are the ones I can already start filling in. If you’ve never done FirstDraft60 and want to try it, you can see the whole series at the #FirstDraft60 page linked in the header. The tasks do build on each other after the first several days, but you can move them around to best suit your style. Be sure to start with Day 1—Determining Your Commitment and Motivation with Guided Questions. My one hour of writing time is scheduled for each day from 7 PM to 8 PM Central time. I’ll try to remember to send reminders on Twitter, followed by results afterward each day (after all, I do have time for social media scheduled both before and after the writing block). If you’re playing along at home, you can join me at that time or set your own schedule for when you’ll be writing (or reading, if you’re not a writer!). Be sure to check in on Twitter or Facebook with your results! Assignment 1: Determine and share with the “class” (i.e., leave a comment) how you intend to keep up with all of the details/background info for your Story in Progress. Will you use a three-ring binder? OneNote? Scrivener? Evernote? Or do you have some other method of keeping track of your story/series details? Tell us what it is—and share links if you use a specific website or software. 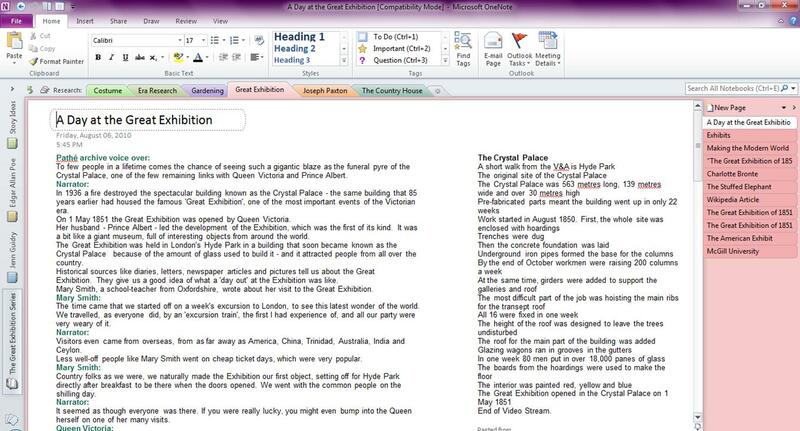 As always, I’m using OneNote. But I’ll also incorporate Pinterest, PowerPoint, and handwritten notes along the way as well. Assignment 2: Create the Characters section of your Story Bible. How do you plan to organize this? What information do you already have that you can start populating this section with? Other than figuring out how you plan to organize it and adding in what info you already know about your characters, don’t worry about how many pages you’ll need. We’re going to work on that next week. As I showed examples of in the original post, I’ve set up a section for Eleanor (female protagonist), a section for James (male protagonist), and a section for secondary characters. Each of these can now have numerous pages added. Assignment 3: Determine how you will keep track of the details of your settings. What tool or combination of tools do you think you’ll use? Naturally, setting is getting its own section as well. I know I’ll have several to keep track of. With the way this story is in my head right now, the possible locations are the Tierra Dulce plantation in Jamaica, a steamship from Jamaica to Philadelphia, Michael and Serena Witherington’s grand home in Philly—and the shipping business offices/warehouses(? )—and, possibly, Portsmouth, England. then there are the places in each of the general locations that will need to be created/chosen and fleshed out. But a lot of that is done in the writing process—once I’m actually writing the scenes—not in the prep process. Assignment 4: Determine how you will keep track of props and costumes. What tool or combination of tools do you think you’ll use? This is something I’ve never really been purposeful about tracking in my writing before—and I’ve spent hours trying to find something in a manuscript because I know I mentioned it before and I need to double-check what color it is or what size it is or where it got left. So I’ll go through the questions in the original post about these and come up with some ways to easily track the props that might be important to the story. Revisions—Will you revise as you write or leave it until after the first draft is completed? How will you keep track of changes that need to be made as you’re in the writing process? I’ve set up a section for this with pages for Characters, Plot, Subplots, Setting, History/Research, and Other. But I don’t know if I’ll use this method or keep chapter-by-chapter notes. In the past, I always added notes into the file for the chapter where the revision needed to be made in the second-draft process. But because I write each chapter in a separate file, again, this makes them hard to find. So what I need to do is keep making the comments in my chapter files, but copy them over to the Revisions section of the OneNote notebook before I finish for the day. Creating a Style Guide is something I’ve blogged about before. 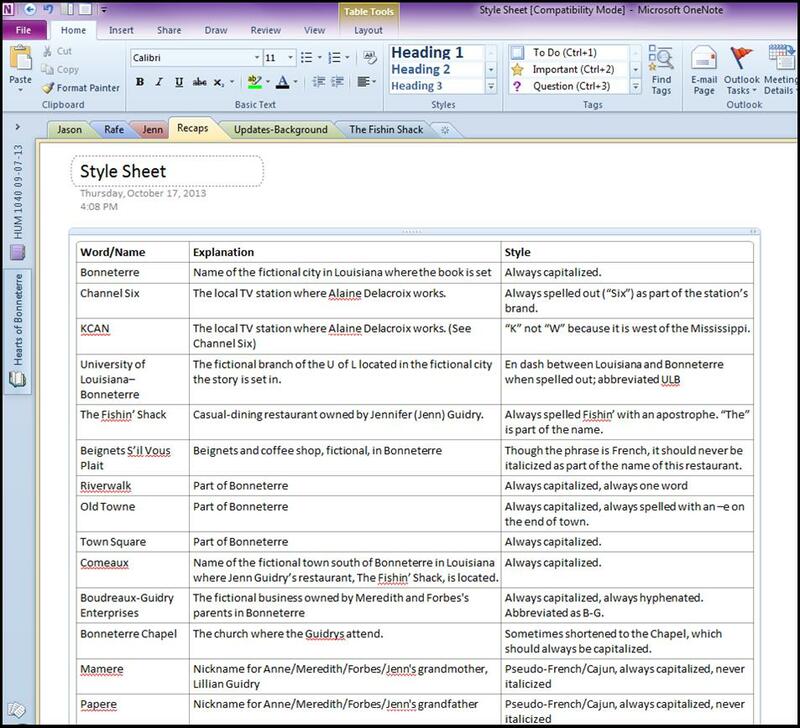 A Style Sheet is something that you’ll build as you prep and as you write. It’s a place to keep track of the unique items in your story as you come up with them. Setting it up now—before you really dig into your prep work—and then filling it in throughout the prep process will get you in the habit of using it that will continue on into the writing process. In the beginning, my style sheet probably won’t be quite so formally laid out. Likely, it’ll just be a bulleted list that I’ll add to each week when I do my story-bible update (or as I make decisions while planning/writing). But before I go into revisions for the second draft, I will reorganize it into a format that makes it easy to look things up. Research Repository—Whether you’re writing contemporary or historical, realistic or fantastic stories, you’re going to have to do some research. How will you keep track of all of it so that you’re not recreating the wheel whenever you need something you know you’ve already looked up? While there are a few story ideas in the Ransome’s Legacy series that necessitated some research while I was writing out the idea, I didn’t have any for Her Independent Heart So I’ve set up a separate section group for Research, but it’s empty at the moment. I may also be incorporating the academic tool of an annotated bibliography to keep track of what information I’m pulling from what resources, as well.